Halloween is days away, which means Halloween candy is everywhere! Because I have one of the biggest sweet tooth's around, this presents a problem. If there is something sweet in our house, you can guarantee I will eat it. Jon, on the other hand, has much better self control. But I digress. So while I'm standing in the candy aisle, meticulously thinking about what type of treats I should buy, it hits me. 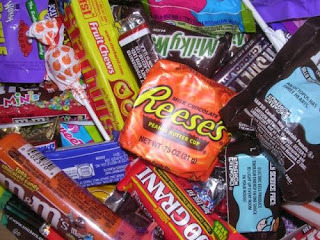 I should buy candy that I don't like! Such a simple solution, right? To combat the urge to delve into the leftover pieces you don't hand out, pick something that you wouldn't normally eat. I don't mean you have to buy something nasty that the kiddos won't want. We all can remember disliking those certain houses that were notorious for handing out the tasteless, cheap candy when we were growing up. I'm not saying that you have to be "that" house. Here's an example. I don't like nuts. In anything. So what did I buy? Snickers. Problem solved. That's right. You won't catch me sneaking into that bag after all of the trick-or-treaters have gone. Nope. I can send those on to work with Jon and escape the sugars that haunt me.